Google has announced a major change to its search engine ranking algorithm, and if your website is not “Mobile-Friendly” you are going to see traffic to your website drop. Starting April 21st, Google will be rolling out it’s latest changes to its ranking algorithm. The main focus of this update is to provide more appropriate search results to mobile users. Google is Putting an End to Pinching & Zooming. When a user does a search on a mobile device, they are more likely going to find what they are looking for on a site that is optimized for a mobile device. In order to provide a better experience to it’s users, Google has decided to give preference to sites that are “Mobile-Friendly.” It makes sense – if you are browsing the web on your phone, you do not want to be pinching and scrolling trying to find whatever you are looking for. On the bWEST Facebook page, we had posted about the change last November and had predicted that this change would eventually be a ranking factor. Now it is becoming a reality, and we want to ensure that everyone is ready for it. If your site is not optimized for a good mobile experience then Google will not want to show your site within it’s search results. With the continuing amount of growth within mobile search it is imperative that your site complies with this latest update. Take out your phone and do a Google search for your company. 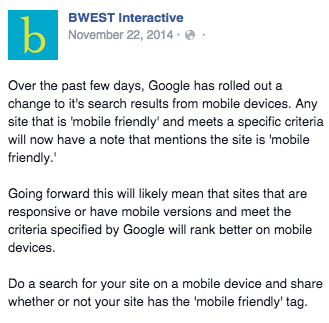 If you see the “Mobile-Friendly” designation in the results beside your website, then that page passes the test. Use the Mobile-Friendly Test provided by Google. Keep in mind that in order maintain your current rankings on mobile search, your entire site needs to be Mobile-Friendly and not just your homepage, so test multiple pages. Your site is either “Mobile-Friendly” or it isn’t – there is no grey area. The changes to Google will start to roll out on April 21st and will likely take a few days to a week before you may start to see an impact on your site’s search rankings and overall traffic levels. If you determine that your site is not “Mobile-Friendly” and need some assistance please leave a comment below, or contact us to ensure your site is ready. It is astounding how many websites there are out there for prominent companies that are still not responsive. I was talking to a realtor today who just had their website redesigned last week (not by us) and came to us for SEO advice. The first thing I checked was whether the site was responsive or not and to my surprise it was not. Chris B. is that comment a shot at us 🙂 Ha! As a non-profit music school we are very budget conscious but we are excited to be working with bWEST on our new ‘responsive’ and much improved Victoria Conservatory of Music website. I hope sites that dip with this algorithm change recover once they become responsive.